Great Western Entertainments, Frome, Entertainment agencies South West. Live music, solo singers, duo's,groups, comedians, speciality acts. Thanks for visiting the site. 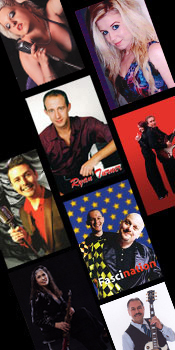 Great Western Entertainments is based in Somerset, and is one of the leading entertainment agencies in the South West. Providing top quality, professional acts for any occasion! Live music, solo singers, musicians, duo's and groups for a wide range of events and venues. We have all manner of entertainers, whatever your budget we'll try to find you the best value for money. Our extensive catalogue of artistes means that there's something to suit every occasion. Whilst this website can provide you with a good idea of what's on offer and may give you a good base of reference, we would urge you to give us a call and discuss your specific requirements. We are always happy to work with clients to tailor our service to meet their needs. Have a look at what we have to offer, then give us a call, I look forward to hearing from you!